In recent years, with the popularization of the two-sided clamping tool system, significant effects have been achieved in improving the processing efficiency. However, the tool clamping technology is always centered on continuous improvement and improvement, and the two-sided clamping tool system has a new breakthrough in high-speed and high-precision machining, but it is difficult. It is for this reason that in order to improve the coupling accuracy between the tool and the shank, the hot-mounted tool system has attracted great attention in place of the spring clamping system. The hot-mounted tool system is a tool - a clamping method that does not involve any parts between the shanks. It solves the problems of balance, runout accuracy and clamping strength that are extremely important in high-speed and high-precision machining. However, there are still some areas for improvement in the hot-packing tool system that is currently being promoted. For example, compared with the past clamping method, the tool loading and unloading time is longer, the operation is not convenient, and there are many kinds of tool types that can be used. Limits, etc. The Thermo grip tool system introduced in this paper is a newly developed product of OTTO BILZ of Germany. It retains the advantages of the previous hot-mounted tool system, improves the operation performance and improves the practical level of the system. The hot-mounted tool system usually uses a heat-sensing device to heat the clamping portion of the shank in a short time, and the inner diameter of the shank expands, and the tool is immediately loaded into the shank. When the shank is cooled and contracted, it can give a uniform pressure to the clamping surface of the tool, resulting in a high radial clamping force to hold the tool firmly. The Thermo grip uses an induction heating coil with a high energy field to complete the tool change in a short time. Due to the local characteristics of the electromagnetic field, the holder of the holder can be heated within 10 seconds, and the inner diameter of the holder is expanded, making it easy to replace the tool. Due to local heating, the energy delivered to the collet can be kept to a minimum. When the cutting tool is loaded or removed, the collet cools rapidly, so heat is rarely transmitted to Other parts of the collet or to the shank of the tool. Compared with objects heated with flame or hot gas, the hot-mounted chuck can be said to be in a cold state, and the entire chuck can be completely cooled within 60 seconds. It is a tabletop device that can be placed on a workbench and weighs less than 50kg. Both the controller and the frequency oscillator are mounted inside the machine for a clean and compact appearance. The cylinder can lower the induction coil to the heating part, and then return to the original position after heating. The clamping range is îžˆ6ï½ž32mm (Ã˜3-Ã˜50mm for ISG3200), and there are 3 kinds of coils to choose from. The ISG3000's sensing unit requires three phases of 200V (32A) and 6 bar pressure. The operating panel is located in front of the unit and can be easily programmed manually. The information processor automatically selects the output and heating time based on the input tool material, diameter, and other related data. After the system starts working, the heating coil drops with the air pressure and starts to heat down when it is lowered to the predetermined position. The heating time varies depending on the diameter of the tool, but the fluctuation range is only between 5 and 10 seconds. Since the heating time is short, heat cannot be conducted to a location other than the chuck. OTTO BILZ has developed a cooling bushing for cooling the Thermo grip tool system to reduce cooling time. 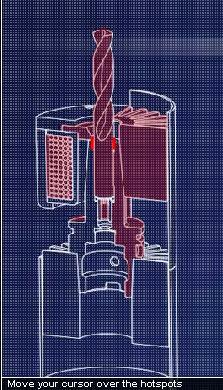 The bushing is in direct contact with the outer circumference of the heated Thermo grip collet, transferring heat to the cooling ribs as quickly as possible. The ribs have a heat dissipation effect of 10 times, and these ribs can exert a forced cooling effect. This type of cooling device ensures that the temperature of the shank is reduced to a safe level within 60 seconds. Hot-mounted chucks generally have the following common advantages: 1 slender shape; 2 high vibrating accuracy; 3 large clamping force; 4 can adapt to high-speed rotation; 5 easy to access the workpiece; 6 can be used for internal cooling . Quickly shrinking With a special cooling bushing, the chuck is quickly cooled in the bushing after the tool is installed or removed. The cooling time is less than 60 seconds, and 3 to 4 tools can be replaced per minute. Can be made of high-speed steel In order to reduce the heat transfer into the shank, the chuck is made of cemented carbide material, but it is expensive, so it can also be made of high-speed steel with the same thermal expansion coefficient as the tool. Safe and reliable Heating is local heating, tool performance is not affected by heating; cooling uses cooling bushing, the operator does not directly contact the hot fixture and tool to ensure the safety of the operator. Energy-saving Thermo grip is heated to 200 Â°C, which requires about 100KJ of energy. However, the system only heats the chuck. Therefore, the energy consumption can be reduced to about 20kJ, and the cooling time is also proportionally shortened. The energy-saving effect is very obvious. Long service life The system uses the best heat treatment specification and the heating temperature is below 400 Â°C, which is much lower than the temperature that causes the internal structure of the material to change. Therefore, after repeated use for 2000 times, the accuracy of the chuck does not change, and although the hardness slightly decreases, the concentricity can remain unchanged. Tool presetting function The required length of the tool can be adjusted before the collet is cold-shrinked. As shown in Fig. 4, the tool (C) is inserted into the clamping sleeve (A) through the adjuster (B), and the adjusting screw is rotated while rotating. (D) Adjust the tool to the predetermined position. OTTO BILZ's Thermo grip tool system has a pendulum accuracy of 3Î¼m. For balance accuracy, BT40/BT50 is G6.3/15000r/min, and HSK63A/HSK 100A is G2.5/15000r/min. The size of the system is 6 to 32 mm.